This two or three day introductory level course is specifically designed for physical and occupational therapists and certified assistants who work with adults who have suffered a stroke or brain injury. This course will provide participants with a comprehensive whole body and whole person approach to assessment, management planning and management of walking. This course will utilize movement analysis and an effective, outcome oriented and inclusive management approach based on concepts of normal movement, movement sciences, the Neuro-Integrative Functional Rehabilitation and Habilitation approach (NEURO-IFRAH®) by Waleed Al-Oboudi. Creative progressions in resolving impairments and developing control and carry over for patients with various levels of function will be demonstrated and discussed. Therapists and assistants working in acute rehab, outpatient and home health will benefit from this workshop. The course format will include lecture, problem solving, demonstration of practical application of concepts by the instructors, practice labs and possibly videos demonstrating the application on patients. This course will be followed by intermediate level, advanced and ultra advanced courses on function in upright postures. Information will be shared by lecture, lab and possibly using video or other visual aids. 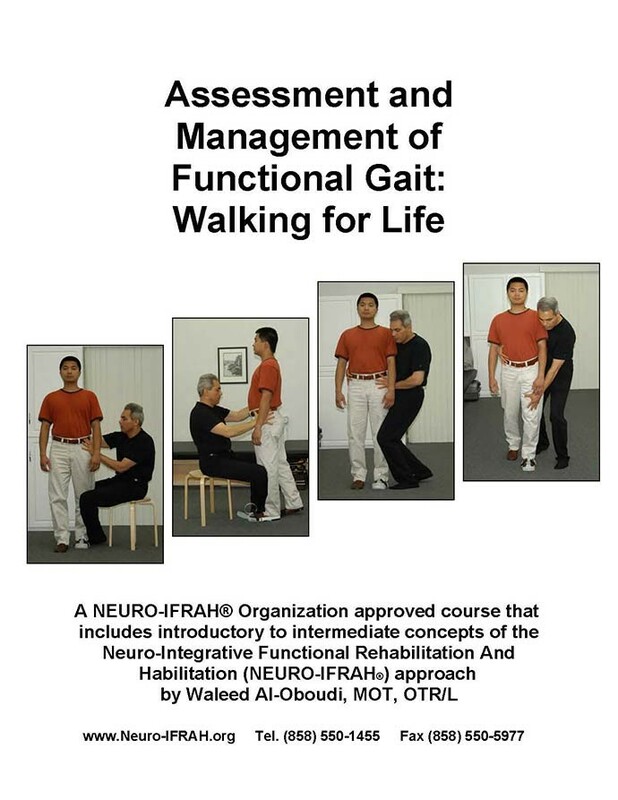 *Completion of the Neuro-IFRAH course Asssessment and Management of Functional Gait is a requirement prior to taking the intermediate course Function in Upright Postures. 1. Identify the importance of walking as a critical step in rehab process and its effect on role assumption and resumption. 2. Identify factors influencing walking (whole body and other systems). 3. Identify normal components of movement in gait. 4. Identify abnormal components of movement interfering with gait in various conditions of observation. 5. Apply handling techniques to facilitate control in standing and pre-gait. 6. Apply handling techniques to facilitate one step at a time, walking forward and backward and turning, for patients with various levels of function. 7. Identify strategies to facilitate increased walking speed to normal on an individual basis. 8. Identify strategies to use tools to facilitate more normal components of movement and responses at various stages of recovery. 9. Identify steps in developing a protocol for team management and carry over for walking.